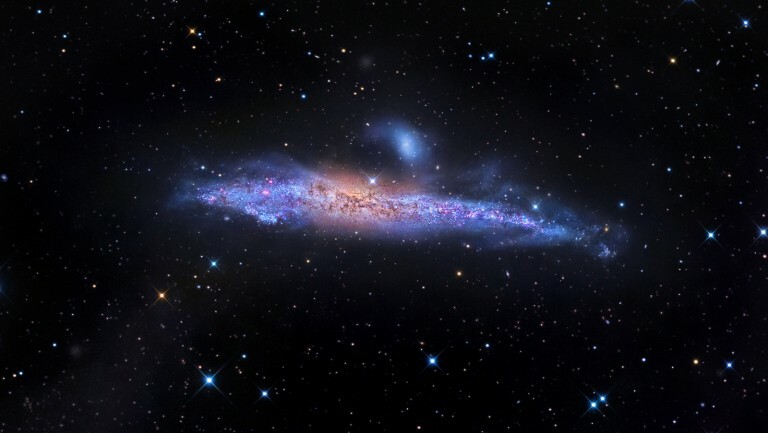 NGC 4631, also known as the Whale Galaxy, contains a central starburst which is a region of intense star formation. The strong star formation is evident in the emission from ionized hydrogen and interstellar dust heated by the stars formed in the starburst. It is named the Whale Galaxy because of it’s strong resemblance to the hump backed whale from our side on view. The most massive stars that form in star formation regions only burn hydrogen gas through fusion for a short period of time, after which they explode as supernovae. So many supernovae have exploded in the center of NGC 4631 that they are blowing gas out of the plane of the galaxy. This superwind can be seen in X-rays and in spectral line emission. The gas from this superwind has produced a giant, diffuse corona of hot, X-ray emitting gas around the whole galaxy.